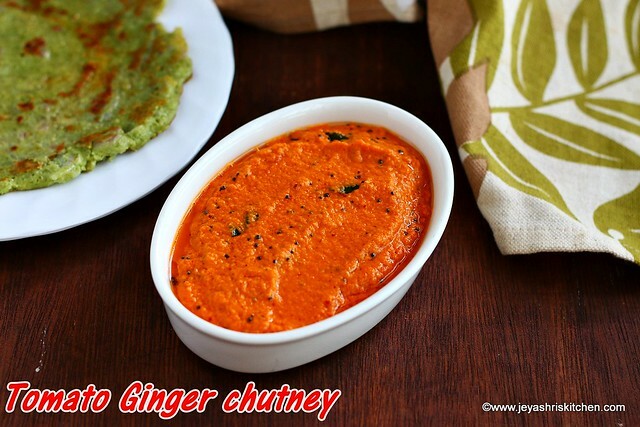 Tomato Ginger chutney, is an easy side dish for pesarattu, idli and dosa. Recently we visited a restaurant in Singapore. It is an Andhra restaurant and a friend recommended to try the MLA pesarattu in that restaurant. They served a tomato chutney with this pesarattu and it tasted very nice. Generally i don't prefer ginger much in my cooking but this chutney i liked very much. Somehow managed to find the ingredients present in the restaurant chutney and attempted at home today. 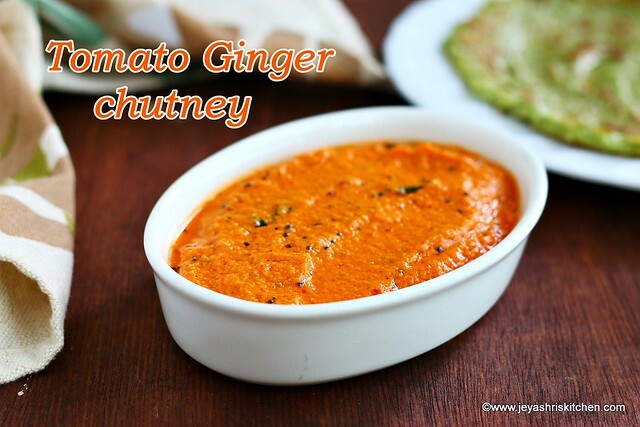 It turned out well and tasted similar to the Tomato Ginger chutney we had in the restaurant. Chop the tomatoes roughly. Peel the skin of the ginger. In a pan add 1 tsp of oil. Add the urad dal, peanuts and red chili. Roast till the dal turns golden brown. Add the ginger and tomato and saute till the tomato shrinks. Grind this along with the jaggery and coconut(if adding). Add 2 tsp of oil in a pan and add the mustard seeds and curry leaves. Once the mustard splutters add it to the chutney. Mix well and serve with idli dosa or pesarattu. You can skip urad dal and add channa dal instead. Instead of jaggery, you can add tamarind. You can add 1-2 cloves of garlic or the tomato ginger chutney. In place of Groundnut what we can Use? As I don't like Groundnut Smell! Just omit the peanuts if you don't like it.